HO CHI MINH HIGHWAY, Vietnam (AP) -- If relentless American bombing didn't get him, it would take a North Vietnamese soldier as long as six months to make the grueling trek down the jungled Ho Chi Minh Trail. Today, you speed along the same route at 60 mph, past peaceful hamlets and stunning mountain scenery. The trail, which played an important role in the Vietnam War, has been added to itineraries of the country's booming tourist industry. Promoters cash in on its history, landmarks and the novelty of being able to motor, bike or even walk down the length of the country in the footsteps of bygone communist guerrillas. Many sections of the old trail, actually a 9,940-mile web of tracks, roads and waterways, have been reclaimed by tropical growth. But a main artery has now become the Ho Chi Minh National Highway, probably the country's best and the largest public works project since Vietnam War ended 30 years ago. In between, the route passes battlefields like Khe Sanh and the Ia Drang Valley, skirts tribal villages of the rugged Central Highlands and offers easy access to some of the country's top attractions -- the ancient royal seat of Hue, the picturesque trading port of Hoi An and South China Sea beaches. We began a recent car journey in the newly rebuilt city of Vinh, along one of the trail's main branches. Here in "Vietnam's Dresden," every building but one was obliterated by U.S. bombing, which attempted to stop the flow of foreign military aid through the city's port. American pilots also suffered their greatest losses of the war over its skies. Nearby, in the rice-farming village of Kim Lien, is the humble hut where Vietnam's revolutionary leader Ho Chi Minh was born and a museum dedicated to his turbulent life. Given Ho's standing as a national icon, the village draws an average of 1.5 million domestic visitors and a smattering of foreigners each year. It was on one of Ho's birthdays, on May 9, 1959, that construction of the trail began with the establishment of Military Transport Division 559, made up of 440 young men and women. Over the next 16 years, the trail, which also wound through neighboring Laos and Cambodia, carried more than a million North Vietnamese soldiers and vast quantities of supplies to battlefields in South Vietnam despite ferocious American air strikes. "There are some who argue that American victory would have followed the cutting of The Trail," writes John Prados in "The Blood Road." "The Trail undeniably lay at the heart of the war. For the Vietnamese of the North the Ho Chi Minh Trail embodied the aspirations of a people ... hiking it became the central experience for a generation." At Dong Loc, 18 miles south of Vinh, we stopped at one of many memorials to the thousands who didn't complete that hike -- a hillside shrine with the tombs of 10 women, aged 17 to 24, killed in bombing raids. Joss sticks, flowers and the articles of female youth -- pink combs and little round mirrors -- lay on each of the last resting places. "School children come here every day. It's important in educating the young about the sacrifices of the old generation," said Dau Van Coi, secretary of the local youth union guiding visitors to what was once a major trail junction. Exhibiting no hostility to American visitors, he noted that U.S. warplanes dropped more than three bombs per 10 square feet on the area. Children play near dilapidated playground equipment in A Luoi, Vietnam.Farther down the trail, at the Highway 9 National Cemetery, bemedaled veteran Nguyen Kim Tien searched for fallen comrades among the 10,000 headstones. An elderly woman and her daughter wept before three of them -- those of the older woman's father, husband and a close relative. 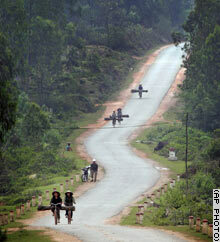 Although it's still a trail of tears three decades after the guns fell silent, Ho's road looks decidedly to the future. "We cut through the Truong Son jungles for national salvation. Now we cut through the Truong Son jungles for national industrialization and modernization," said former Prime Minister Vo Van Kiet when the 10-year project began in 2000. The government says the highway will stimulate the economy in some of Vietnam's poorest, most remote regions, relieve congestion on the only other north-south road, National Highway 1, and increase tourism revenue. Besides conventional tours, several companies offer mountain biking along sections of the trail and expeditions on Russian-made Minsk motorcycles out of the 1950s. However, the highway has sparked domestic and international criticism that it will lead to further decimation of Vietnam's already disappearing forests, attract a flood of migrants into ethnic minority regions from the crowded coast and disturb wildlife at several protected areas. The Switzerland-based World Wide Fund for Nature has criticized the project as "the single largest long-term threat to biodiversity in Vietnam." So far, little of the officially hoped-for development is evident. In central Vietnam, one drives for long stretches meeting just the occasional Soviet-era truck, decrepit tractor or water buffalo-drawn cart as the highway winds through valleys flanked by spectacular limestone cliffs. At some places like the A Shau valley town of A Luoi, just a few shacks and farm houses when seen five years ago, a mini-boom is clearly afoot. There's a bustling market selling baskets of fruit, Japanese watches and delicious French bread, and newly built houses abound. From the highway, which expands to four lanes as it runs through the crossroads town, Dong Ap Bia looms in the hazy distance. American soldiers called it Hamburger Hill because of the number of lives ground up in the 1969 battle on its ridges. Almost all traces of American presence in A Luoi have vanished. Only the old people can point out the helicopter landing field, now a school playground with a decrepit merry-go round featuring three little airplanes. The laughing youngsters who crowd around the foreign visitors know nothing of the war.